Ryan grew up in Springfield, MO and is a 2007 graduate of the University of Texas. He joined Rich & Cartmill shortly after graduation following in the footsteps of his father Carrel who is currently a Vice-President. He earned his Certified Insurance Counselor (CIC) designation in 2010 and earned his Chartered Property Casualty Underwriter (CPCU) designation in 2016. 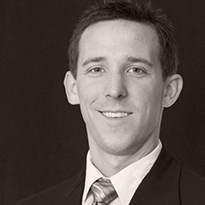 Ryan specializes in Long Term Care facilities and is an active member in several senior living associations. He is currently affiliated with Missouri Health Care Association, Missouri Assisted Living Association, Missouri Nursing Home Administrators Association, and LeadingAge MO . He is also a member of the MAIA Young Agents and the 2017 President-Elect of the CPCU Society of the Ozarks Chapter. When he is not at work Ryan enjoys hunting, fishing, playing soccer, and generally spending time outdoors. He also donates his time as a board member of Lake Country Soccer and is a Big Brother with Big Brothers Big Sisters of the Ozarks.